This I know. This I like. Off the book-shop shelf, I pick up a book. I flick its pages. I scan a paragraph or two. Occasionally, just occasionally, there is that electric moment. The hairs on the neck prickle. The consciousness kicks in. The book sells itself. Just that latter occurred yesterday, in Waterstones on Edinburgh’s Princes Street. 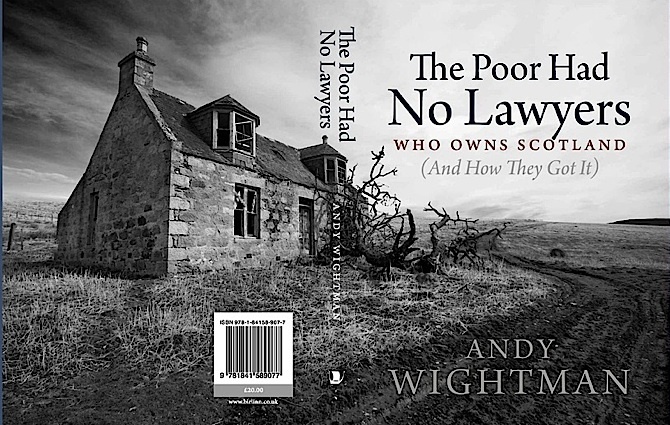 The exact reference was page 3 of Andy Wightman’s The Poor Had No Lawyers. And the quotation was from Tom Johnston, one of the Red Clydesiders of the early twentieth century, and — incredible as it now seems — Secretary of State for Scotland in the war-time coalition government. Show the people that our Old Nobility is not noble, that its lands are stolen lands — stolen either by force of fraud; show people that the title-deeds are rapine, murder, massacre, cheating, or Court harlotry; dissolve the halo of divinity that surrounds the hereditary title; let the people clearly understand that our present House of Lords is composed largely of descendants of successful pirates and rogues; do these things and you shatter the Romance that keeps the nation dumb and spellbound while privilege picks its pockets. Source: Tom Johnston: Our Scots Noble Families, page x.
Wightman’s book was my reading on the last train south from Waverley, surrounded as I was by the hen-parties to Newcastle, and the rugby-men from Newcastle. Its will be my study for the rest of the weekend. Scotland’s wartime supremo was the former Red Clydesider and Labour MP for West Stirlingshire, Tom Johnston, who had been appointed regional commissioner charged with responsibility for civil defence north of the border at the outbreak of hostilities. His success in that post and Churchill’s determination to avoid the industrial troubles on the Clyde during the Great War led the Prime Minister to appoint a man with a long and distinguished left-wing pedigree to the office of Secretary of State for Scotland in February 1941. Churchill had chosen wisely. Johnston was a giant figure in Scottish politics and is revered to this day as the greatest Scottish Secretary of the century. Filed under History, reading, Scotland, social class, socialism.